Doll's Musings: First Post of January! Well, it's the middle of January and I am finally posting. I've wanted to post on a number of occasions but in between packing, working, horrific indigestion, a bought of flu, I haven't had the oomph to do so. Let's see, I had my birthday on the 3rd, which was quiet as usual, Christmas on the 7th, also quiet since I wasn't feeling all too well, and my third ultrasound, baby is beautiful and healthy so far. Lots to celebrate and be thankful for amidst the turmoil of our house. I packed a lot of my stitching stuff away, and am now regretting that since I've wanted to start so many things, but I do have my current projects out so I've been working on those when I can. January is one of those months that I begin to feel the first sprout of glee at the prospect of Spring. I saw the teeniest buds of snowdrops poking through here and there which means crocuses will be on its way soon too. There's always a sense of awakening with the coming of Spring and of course this year, it'll be a big awakening...possibly keeping me awake all night! I look forward to the birth of our child. Not the actual birth, but the after part of course! Now I do have a few things to share with you all. Back in November, I finished a little BBD pillow for dear Jo as a little thank you for the fertility gift she sent to me way back in April. When I was prepping the package for Jo, I heard Titus leaping onto the pillow and rolling around onto the package. Uh oh! There were three pins in the pillow and then there were two! I couldn't find the third pin which freaked me out. I checked Titus all over to see if a pin was sticking in him and thank goodness, there wasn't one. He seemed fine and not like he just ate a pin, plus that would be very out of character for him to do that. He does like to eat toilet paper, but not pins. Anyways, a few weeks ago as we were packing, I moved some books over and found the pin! Phew...what a relief to me! Silly cat! I also received two amazing gifts from two amazing ladies, Melissa and Vickie. 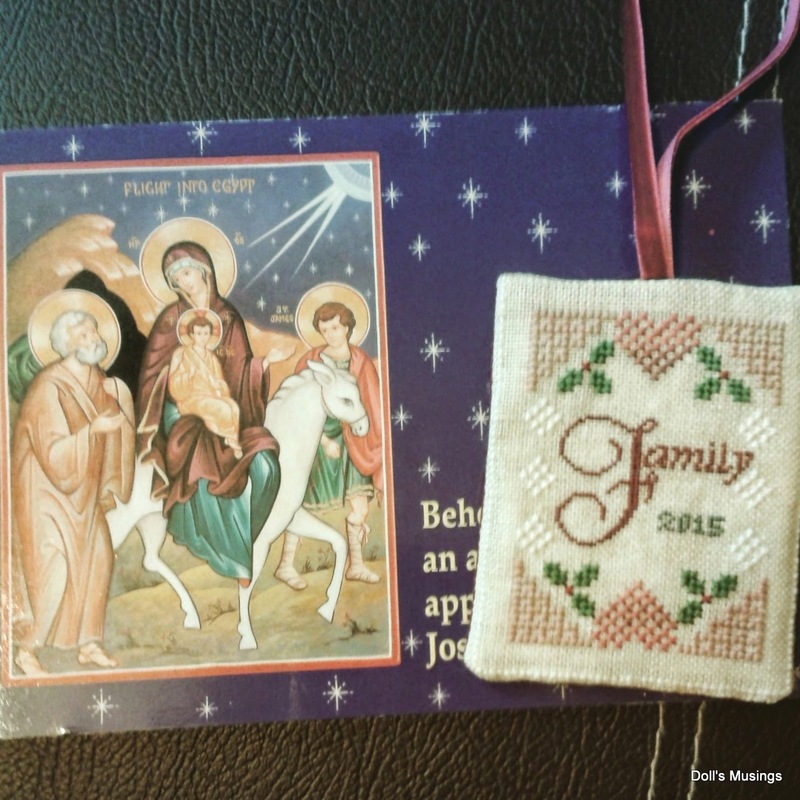 Vickie is so sweet to have sent me yet another lovely little ornament to celebrate our new family. We will be putting this on our tree for this year's Christmas. Thank you my dear friend, we will treasure this ornament for many years!! Then I had the unexpected pleasure of having a tunic made to fit for me by the creative seamstress Melissa, from Words and Blooms. Other than my mom, no one has made clothes for me before and I have to say, Melissa, you did an amazing job!! I love my tunic and it looks great on me with room to grow too! The fabric is a pretty sky blue with whimsical blossoms falling all over. Very comfy too! I did make one new start this year. It's the BBD freebie "Souvenir de France" for one of our French immersion teachers who will be retiring this year. I chose a scrap of linen and GAST Blue Jay to make it with. I hope she will like it! A Sarah Chapple update. I stitched a lot on the borders and just started the second vase last night. Instead of pulling her off the qsnaps to show the border, here's just the vase. I'm really loving stitching on Sarah as I know I won't get much of a chance once Bean arrives. As for Bean, I've been thinking of making things for him/her but have held off because I don't have a baby room yet, so no clue how to decorate it. 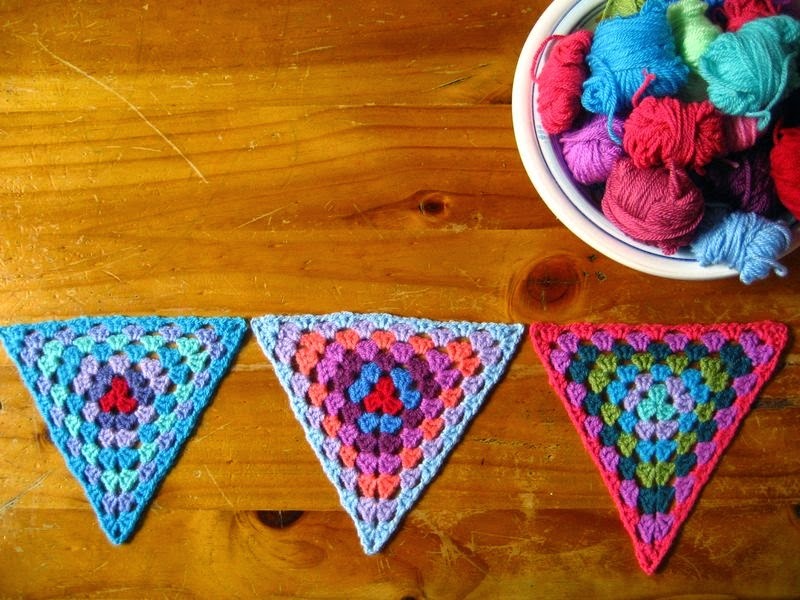 I thought about making some bright coloured Granny square bunting triangles to string up in the room for a burst of colour. I think I'm going to start some tonight and see how it fairs. All my yarn is in a plastic bin which I've kept out so I can still craft. Maybe starting with the bunting will inspire me to make more things for Bean. I'm just not good at making clothes and stuff like that. I so wish I mastered knitting ages ago!! I borrowed Lucy's photo of her granny bunting triangles to show you what I mean. I hope you have enjoyed this little update from me. I wish it was more packed full of stitching but there you have it. I also felt guilty for posting as I have been so behind in blog commenting it's not funny. I did spend some time last weekend going through and reading/commenting and it was fun! I'm amazed at all of you who have been keeping up with the 15-30 starts this month in honor of Debbie. She was such a lovely lady who has inspired us to continue making new starts!! Belated Happy Birthday Anne. Your stitching is gorgeous. Lucy makes such pretty colorful designs. I had to laugh about Titus. I have a cat that eats toilet paper. Congratulations on your upcoming arrival! I guess the fertility gift worked :) Sarah Chapel is looking great, but I agree you won't have all that much time or energy to work on it soon. And you'll have to make a birth sampler. Aren't you the cutest little pregnant lady!? So cute! I've had a pin disappear on me as well, always afraid that Lulu (my dog) had found it. so glad you found yours. Great post ~ loved seeing all the goodies ~ and you look fabulous! But... 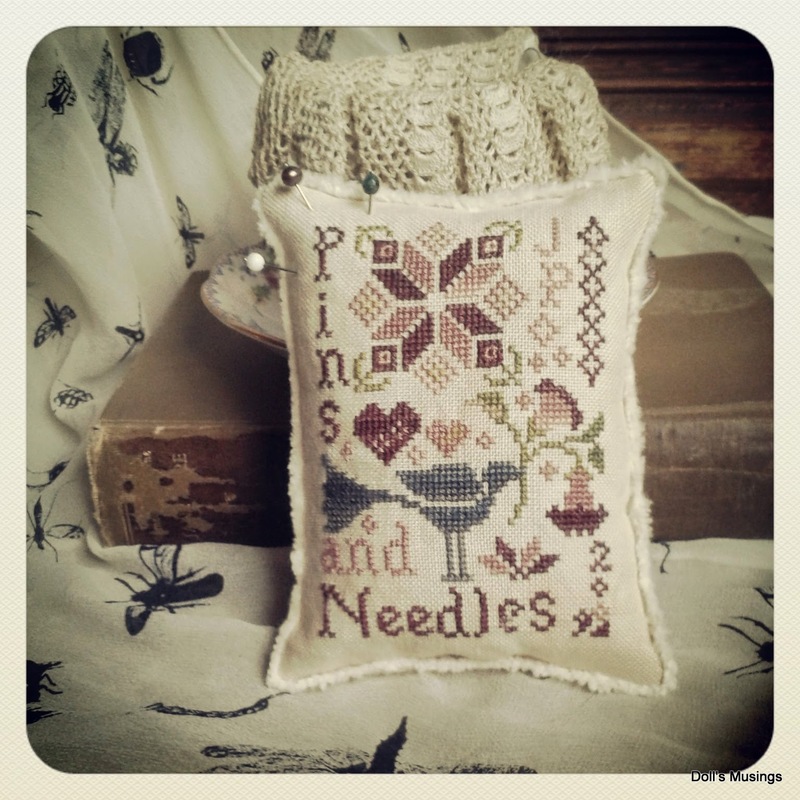 I loved ALL of your photos, such lovely stitching too. Oooh yes a bump!! Your looking really lovely being pregnant too... The saying is 'glowing' and you are!! Look at you little Mama! I am so happy for you three. So glad things are going well, if hectic. That bunting will be wonderful. Pretty stitching and crocheting. Sounds like things are going pretty well. That photo of you is just too cute! Your baby will appreciate that someday! Happy Birthday,if a bit late.It was mine on the 3rd too:-) also quiet. Lovely stitching on Sarah Chapple,I love the colours. Thst is a lovely photo of you at the end of your post. A very happy belated birthday to you. Sarah is looking lovely as are YOU! The granny triangles will be a colorful addition to the little ones room! Take good care of yourself and the little Bean! Sneaking in a birthday, how dare you! :D Happy one, a wee bit late! That bunting sounds like a fun idea and thank goodness you found that missing pin! My friend had her naughty kitty ingest not one, but THREE needles and had to have surgery! It's hilarious that he likes to eat toilet paper though. Mine go for corn cobs (???????). That GAST thread is beautiful eeep. I love those blue eyes, Titus is a handsome fellow. Lovely gifts for Bean's adorable Mom. Happy belated birthday! It is so nice to see that you are doing lots to keep busy, but also preparing for Baby Doll... (oooh...hmmm....)Sarah Chapple is coming along nicely, and the bunting will be so cool if you get it done! Big hugs to you and the Bean! Happy birthday. I love the BBD designs especially, I did the Paris one for a friend and now seeing yours think I must do one for myself. Happy Birthday and Happy New Year. It will be a great year indeed. You look great. Your pins and needles come out great. The tunic looks perfect, a pretty colour. Wonderful stitching, brightly coloured bunting will be perfect for you new arrivals room. You're looking great Anne! I know you feel tired but also you are trying to do A LOT, it seems! Take it easy on yourself. The BBD pillow you made is cute. I'm sure your friend will like the Souvenir de France pillow. Sarah's looking pretty. Vickie's gift is very nice - she does such lovely work. Glad you like the tunic! Now, have I covered everything? Oh yeah, Titus! Hugs to the handsome boy! I was so relieved that you found the missing pin, it's one of the reasons I use the secured needle method of stitching. I used to have a cat and now I have two children! Needles going missing is not fun. Just out of interest, how many scans do you get as standard? In England we get one at 12 weeks and one at 20 weeks and that's it unless you are higher risk. The fashion now is to pay for the 3D scans and get a weird photo of your baby's face! Happy Belated Birthday Anne :) Everything you posted about is lovely. That bunting would look great in Bean's room! What a lovely gift for Jo! I'm glad everything is going well with the pregnancy. Remember to take time for you! Sounds like things will be busy in these upcoming months! Love the tunic Melissa made for you - perfect for your growing bump! I do love the bunting - it will be perfect for the baby's room. Happy Birthday! Pregnancy seems to be suiting you - you look great! Love the idea of a crochet bunting. it would be lovely and colourful in baby's room. I hope you can find some moments to relax over the next few month--I can't imagine how very busy you must be. Good luck with the rest of the packing up--do you move in February? I'm glad to hear all is well with the baby and that everything is progressing as it should! Your stitching is looking great. Oh Anne, so wonderful to read your post and to learn that you and the bean are happy and healthy. And it's visible on you, lol. You have received two great gifts from Vicki and Melissa, both of them such thoughtful stitchers and blogging friends. And this colourful crocheted bunting for the nursery is such a lovely idea. Look at you with bump showing!! Lots of lovely things to look at. Beautiful BBD finish and lovely WIPs. Love to see you and your beautifull belly! Glad all is going well with the baby!! Your on a roll.. have fun with your crafting!! Lovely update Anne! I hope that you are feeling better. 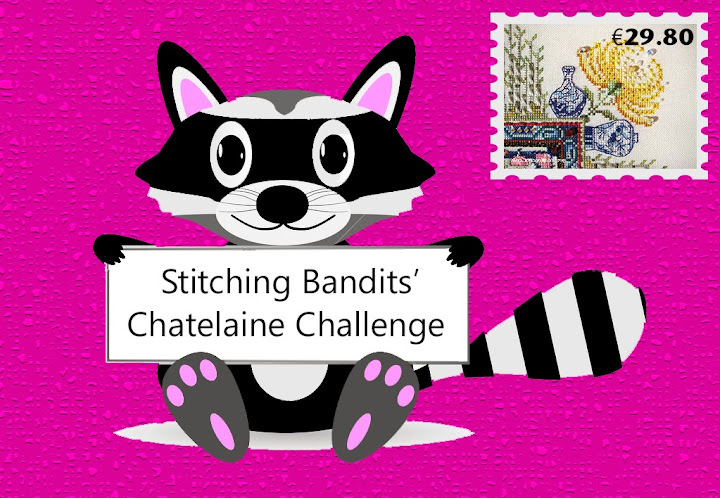 Your stitching is looking wonderful, as are you! I hope everything is continuing to go well with you and bean. Your projects are looking great, especially Sarah.